Philadelphia suburb shootings: At least four dead, "male military veteran" killer suspected. Law enforcement officers near a home in Souderton, Pennsylvania. 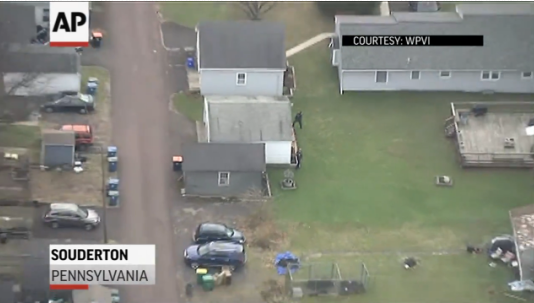 At least four people have been killed in three Montgomery County, Pennsylvania, shootings. A single suspect in the incidents—a “male military veteran“—is reportedly still “on the loose.” The shootings apparently occurred between approximately 4 a.m. and 8 a.m., and a law enforcement official told CNN that a “domestic dispute” is to blame; one of the victims is said to be the man’s ex-wife.